Acquire the knowledge and resources necessary to achieve true success as a leader and enact strategic change and school improvement. In Swimming in the Deep End, author Jennifer Abrams dives deep into the four foundational skills required of effective leadership and change management: (1) thinking before speaking, (2) preempting resistance, (3) responding to resistance, and (4) managing oneself through change and resistance. Throughout the book, readers receive ample guidance for building these vital skills and leading school initiatives and implementation plans that face 21st century challenges head-on. Gain an understanding of the most pressing issues facing schools today, learn why they must be faced, and consider your implementation plan. Enhance your leadership and change-management abilities by mastering the four foundational skills. Learn how to utilize your new mastery of the foundational skills to have critical conversations, resolve conflict, respond to resistance, and manage yourself through change and resistance. Utilize an online appendix of quotes as a source of inspiration and motivation in guiding effective organizational change and strategic planning. Access a comprehensive self-assessment designed to assist you in your growth as a leader. 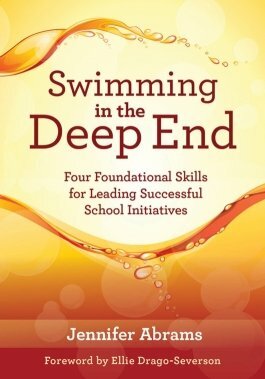 “Reading Swimming in the Deep End felt like having a coaching conversation with the author. Her honest, funny, and direct writing style was engaging and made me feel confident about planning for and executing change of any magnitude. Swimming in the Deep End begins with reflective questions for four areas of change: thinking before you speak, preempting resistance, responding to resistance, and managing oneself through change and resistance. The book includes one chapter for each of these topics, and the chapters include a section related to each question. The organization made it very easy to personalize my reading experience, focusing on the sections where I, as a leader, have the most opportunity to grow. “Graduate school doesn’t teach leaders these necessary skills. Swimming in the Deep End helps any leader (aspiring, new, or veteran) keep his or her head above water while swimming through the change process with fellow educators. Jennifer has done it again! Her latest book gives you the confidence and direction to dive in wearing a life jacket of leadership skills to swim in the deep end of change and keep you healthy and happy as you lead staff in a positive direction.